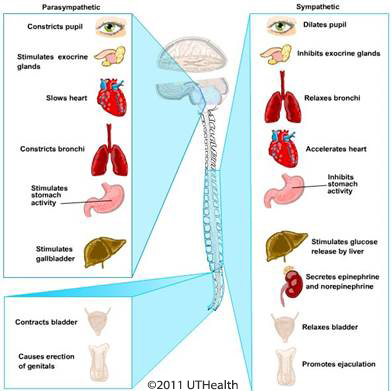 The human nervous system is divided into the central nervous system (CNS) and the peripheral nervous system (PNS). The CNS, in turn, is divided into the brain and the spinal cord, which lie in the cranial cavity of the skull and the vertebral canal, respectively. The CNS and the PNS, acting in concert, integrate sensory information and control motor and cognitive functions. The adult human brain weighs between 1200 to 1500 g and contains about one trillion cells. It occupies a volume of about 1400 cc, approximately 2% of the total body weight, and receives 20% of the blood, oxygen, and calories supplied to the body. The adult spinal cord is approximately 40 to 50 cm long and occupies about 150 cc. 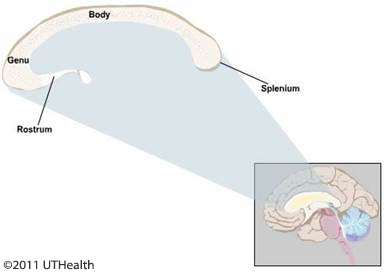 The brain and the spinal cord arise in early development from the neural tube, which expands in the front of the embryo to form the main three primary brain divisions: the prosencephalon (forebrain), mesencephalon (midbrain), and rhombencephalon (hindbrain) (fig. 1A). These three vesicles further differentiate into five subdivisions: telencephalon, diencephalon, mesencephalon, metencephalon, and the myelencephalon (fig. 1B). The mesencephalon, metencephalon, and the myelencephalon comprise the brain stem. Figure 1. Schematic lateral view drawing of human embryo at the beginning of the 3rd (A) and 5th (B) week of gestation. The telencephalon includes the cerebral cortex (cortex is the outer layer of the brain) which represents the highest level of neuronal organization and function (fig.s 2A and 2B). 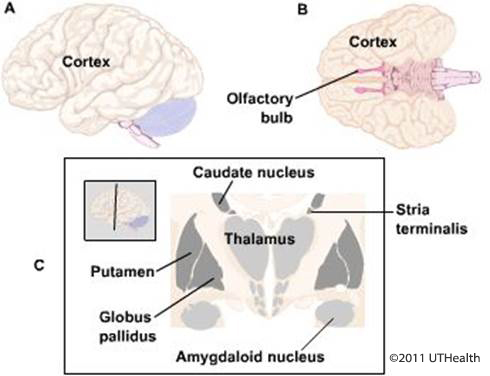 The cerebral cortex consists of various types of cortices (such as the olfactory bulbs, fig. 1.2B) as well as closely related subcortical structures such as the caudate nucleus, putamen, globus, amygdala and the hippocampal formation (fig. 2C). Figure 2. Lateral (A) and ventral (B) schematic drawing of the cerebral cortex. In C, drawing of subcortical structures. The diencephalon consists of a complex collection of nuclei lying symmetrically on either side of the midline. The diencephalon includes the thalamus, hypothalamus, epithalamus and subthalamus (fig. 3). Figure 3. Shows the main diencephalon nuclei. 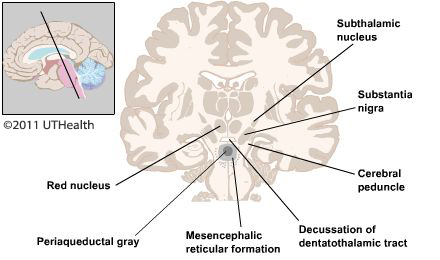 The mesencephalon (or midbrain) consists of several structures around the cerebral aqueduct such as the periaqueductal gray (or central gray), the mesencephalic reticular formation, the substantia nigra, the red nucleus (fig. 4), the superior and inferior colliculi, the cerebral peduncles, some cranial nerve nuclei, and the projection of sensory and motor pathways. Figure 4. Schematic drawing of subcortical diencephalic and mesencephalic structures. The metencephalon includes the pons and the cerebellum. The myelencephalon (spinal cord-like) includes the open and closed medulla, sensory and motor nuclei, projection of sensory and motor pathways, and some cranial nerve nuclei. Figure 5. Schematic lateral view of the metencephalon and a spinal cord section with ventral and dorsal root fibers, and dorsal root ganglions. The caudal end of the myelencephalon develops into the spinal cord. The spinal cord is an elongated cylindrical structure lying within the vertebral canal, which includes the central canal and the surrounding gray matter. The gray matter is composed of neurons and their supporting cells and is enclosed by the white matter that is composed of a dense layer of ascending and descending nerve fibers. 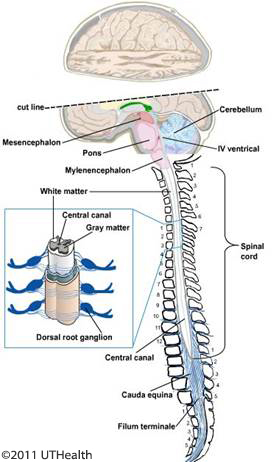 The spinal cord is an essential link between the peripheral nervous system and the brain; it conveys sensory information originating from different external and internal sites via 31 pairs of spinal nerves (fig. 5). These nerves make synaptic connections in the spinal cord or in the medulla oblongata and ascend to subcortical nuclei. The central nervous system, which includes the spinal cord and the brain, is the most protected organ in the human body. It is protected from the external environment by three barriers: skull, meninges, and CSF. The meninges are composed by three fibrous connective tissues (fig. 6). The most external is a dense collagenous connective tissue envelope known as the dura mater (Latin for “hard mother”). The second, or the intermediated membrane, is a delicate non-vascular membrane of fine collagenous layer of reticular fibers forming a web-like membrane, known as the arachnoid (Greek for “spider”). It is separated from the inner pia layer by subarachnoid space, which is filled with cerebrospinal fluid. 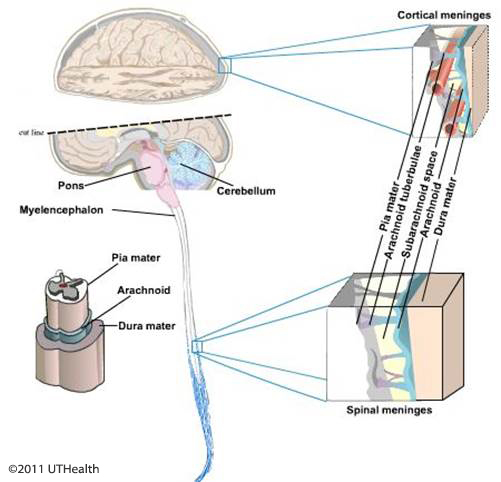 The inner most delicate connective tissue membrane of collagenous is the pia mater, a thin translucent elastic membrane adherent to the surface of the brain and the spinal cord. Blood vessels located on the surface of the brain and the spinal cord are found on top of the pia matter. The meninges are subject to viral and bacterial infection known as meningitis, a life-threatening condition that requires immediate medical treatment. Figure 6. Schematic drawing of the brain and spinal cord meninges. The space between the skull and the dura is known as the epidural space. The space between the dura and the arachnoid is known as the subdural space. The space between the arachnoid and the pia is known as the subarachnoid space. In this space, there is a clear liquid known as the cerebrospinal fluid (CSF). The CSF serves to support the CNS, and to cushion as well as protect it from physical shocks and trauma. The CSF is produced by the choroid plexus which is composed of a specialized secretory ependymal layer located in the ventricular system. The ventricular system is a derivative of the primitive embryonic neural canal. This system is an interconnected series of spaces within the brain containing the CSF (fig. 7). Figure 7. Schematic drawing of ventricular system in four different angles. In general, the CNS can be divided into three main functional components: the sensory system, the motor system, and homeostasis and higher brain functions. The sensory system consists of the somatosensory, viscerosensory, auditory, vestibular, olfactory, gustatory, and visual systems. The motor system consists of motor units, and the somatic (skeletal muscle) system, the spinal reflexes, the visceral (autonomic) system, the cerebellum, several subcortical and cortical sites, as well as the brain stem ocular motor control system. The homeostasis and higher functional system includes the hypothalamus, cortical areas involved in motivation, insight, personality, language, imagination, creativity, thinking, judgment, mental processing, and subcortical areas involved in learning, thought, consciousness, memory, attention, emotional state, sleep and arousal cycles. The telencephalon is the largest and most obvious parts of the human brain are the cerebral hemispheres. The cerebrum has an outer layer - the cortex, which is composed of neurons and their supporting cells, and in fresh brain, has a gray color thus called the gray matter. Under the gray matter there is the white matter, which is composed of myelinated ascending and descending nerve fibers, and in fresh brain have a white color. Embedded deep within the white matter are aggregation of neurons exhibiting gray color and known as subcortical nuclei. The cerebral hemispheres are partially separate from each other along the midline by the interhemispheric fissure (deep groove) the falx cerebri (fig. 8A); posteriorly, there is a transverse fissure that separates the cerebral hemisphere from the cerebellum, and contains the tentorium cerebellum. The hemispheres are connected by a large C-shaped fiber bundle, the corpus callosum, which carries information between the two hemispheres. Figure 8. Schematic drawing of six cortical lobes: Dorsal view (A), Lateral view (B), Mid-sagittal section showing the limbic lobe (in green) (C), and Horizontal section showing the insular cortex (D). For descriptive purposes each cerebral hemisphere can be divided into six lobes. Four of these lobes are named according to the overlying bones of the skull as follows: frontal, parietal, occipital and temporal (figs. 8A and 8B), the fifth one is located internally to the lateral sulcus – the insular lobes (figs. 8B and 8D), and the sixth lobe is the limbic lobe (fig. 8C) which contains the limbic system nuclei. Neither the insular lobe nor the limbic lobe is a true lobe. Although the boundaries of the various lobes are somewhat arbitrary, the cortical areas in each lobe are histologically distinctive. The surface of the cerebral cortex is highly convoluted with folds (gyri), separate from each other by elongate grooves (sulci). These convolutions allow for the expansion of the cortical surface area without increasing the size of the brain. On the lateral surface of the cerebral hemisphere there are two major deep grooves-sulci (or fissure), the lateral fissure (of Sylvian) and the central sulci (of Rolando), these sulci provide landmarks for topographical orientation (fig. 9A). The central sulcus separates the frontal lobe from the parietal lobe and runs from the superior margin of the hemisphere near its midpoint obliquely downward and forward until it nearly meets the lateral fissure (figs. 8A and 8B). 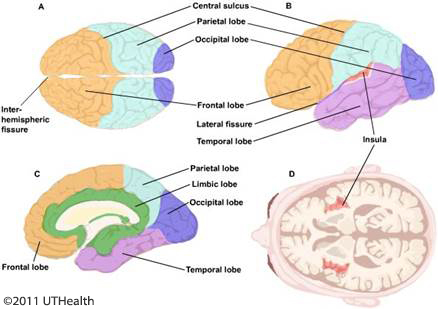 The lateral fissure, separating the frontal and parietal lobes from the temporal lobe, begins inferiorly in the basal surface of the brain and extends laterally posteriorly and upward, separating the frontal and parietal lobes from the temporal lobe (fig. 9A). The frontal lobe is the portion which is rostral to the central sulcus and above the lateral fissure, and it occupies the anterior one third of the hemispheres (figs. 8 and 9). The boundaries of the parietal lobe are not precise, except for its rostral border – the central sulcus. The occipital lobe is the portion which is caudal to the parietal lobe (figs. 8 and 9). 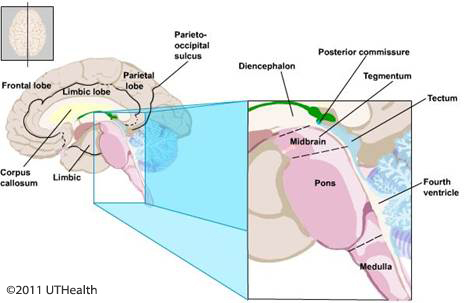 Along the lateral surface of the hemisphere, an imaginary line connecting the tip of the parietal-occipital sulcus and the preoccipital notch (fig. 9A); separate the parietal lobe from the occipital lobe. On the medial surface of the hemisphere (fig. 9B), parieto-occipital sulcus forms the rostral boundary of the parietal lobe. The temporal lobe lies ventral to the lateral sulcus, and on its lateral surface, it displays three diagonal oriented convolutions-the superior, middle, and inferior temporal gyri (fig. 9A). The insula lies in the depths of the lateral sulcus. It has a triangular cortical area with gyri and sulci (figs. 8B and 2D, and fig. 9A). 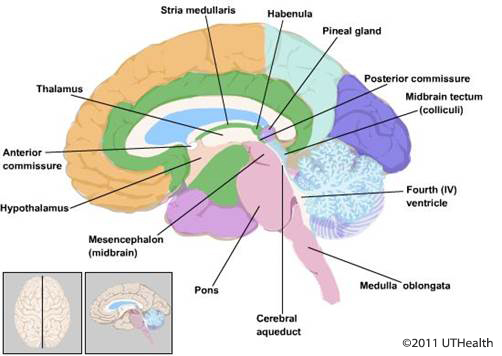 The limbic lobe consists of several cortical and subcortical areas (fig. 9B). Figures 9A and 9B. Lateral schematic drawing of the different cortices, sulci and gyri (A) and mid-sagittal drawing emphasizes the limbic lobe (in green) (B). The cerebral cortex is a functionally organized organ. A functional organized system is a set of neurons linked together to convey a specific type(s) of information to accomplish a particular task(s). It is possible to identify on the cerebral cortex primary sensory areas, secondary sensory areas, primary motor area, premotor area, supplementary motor area and association areas, which are devoted to the integration of motor and sensory information, intellectual activity, thinking and comprehension, execution of language, memory storage and recall. The frontal lobe is the largest of all the brain lobes and is comprised of four gyri, precentral gyrus that parallels to the central sulcus, and three horizontal gyri: the superior, middle, and inferior frontal gyri. The inferior frontal gyrus is comprised of three parts: the orbital, the triangular and opercular. The term opercular refers to the “lips of the lateral fissure. Finally, the straight gyrus (gyrus rectus) and the orbital gyri form the base of the frontal lobe (fig. 9B). Four general functional areas are in the frontal lobe. They are the primary motor cortex, where all parts of the body are represented, the premotor and supplementary motor areas. A region concerned with the motor mechanisms of speech formulation comprised of the opercular and triangular parts of the inferior frontal gyrus are known as Broca’s speech area, and the remainder of the prefrontal cortex is involved in mental activity, personality insight, foresight, and reward. The orbital portion of the prefrontal cortex is important in the appropriate switching between mental sets and the regulations of emotion. The parietal lobe is comprised of three gyri: postcentral gyrus, superior and inferior parietal gyri (fig. 9A). The postcentral gyrus is immediately behind the central sulcus which forms its anterior boundary. The postcentral gyrus comprises the primary somatosensory cortex which is concerned with somatosensory reception, integration and processing sensory information from the surface of the body and from the viscera, and is important for the formulation of perception. Caudal to the postcentral gyrus is the inferior parietal gyrus. The intraparietal sulcus separates the posterior parietal gyrus from the inferior parietal gyrus. The inferior parietal gyrus represents the cortical association area which integrates and processes sensory information from multiple modalities such as auditory and visual information. The inferior parietal gyrus, which is known as Wernicke's area, is also important for language and reading skills, whereas the superior parietal gyrus is concerned with body image and spatial orientations. 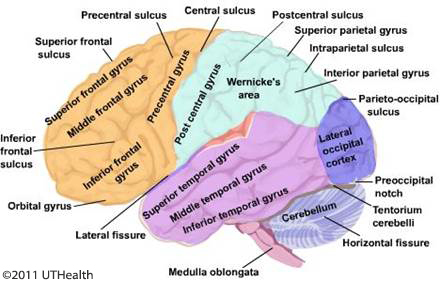 The temporal lobe is formed by three obliquely oriented gyri: the superior, middle, and inferior temporal gyri (fig. 9A). Inferomedial to the inferior temporal gyrus are the occipitotemporal and the parahippocampal gyri, which are separated by the collateral sulcus. The upper surface of the superior temporal gyrus, which extends into the lateral fissure, is called the transverse temporal gyrus (of Heschl) and is the primary auditory cortex. 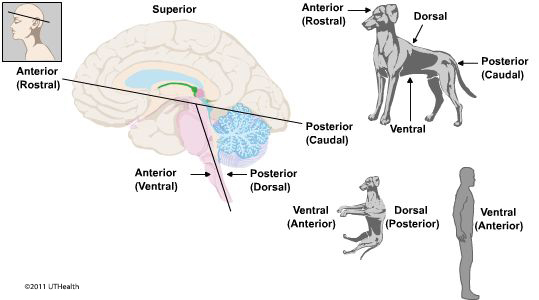 The caudal part of the superior temporal gyrus, which extends up to the parietal cortex, forms part of Wernicke’s area. Wernicke’s area is concerned, in part, with processing the auditory information and is important in the comprehension of language. The inferior part of the temporal lobe (i.e., the occipitotemporal gyri) is involved in visual and cognitive processing. More medially is the parahippocampal gyrus, which is involved in learning and memory. Portions of the frontal, parietal, and temporal lobes, which are adjacent to the lateral sulcus and overlie the insular cortex, are known as the operculum. The inferomedial surface of the temporal lobe is made up of the uncus and the parahippocampal gyrus medially. The inferior surface of the temporal lobe rests on the tentorium cerebelli. The occipital lobe is the most caudal part of the brain, lies on the tentorium cerebelli (fig. 9A) and is comprised of several irregular lateral gyri. On its medial surface, there is a prominent fissure – the calcarine fissure and parieto-occipital sulcus. The calcarine fissure (sulcus) and the parieto-occipital sulcus also define a cortical region known as the cuneus. The cuneus sulcus divides the occipital lobe into the cuneus dorsally and ventrally into the lingual gyrus. The occipital lobe contains the primary and higher-order visual cortex. The insula lobe is located deep inside the lateral fissure and can be seen only when the temporal and the frontal lobes are separated. The insula is characterized by several long gyri and sulci, the gyri breves and gyri longi. There is some evidence that the insular cortical areas are involved in nociception and regulation of autonomic function (figs. 8B and 8D). 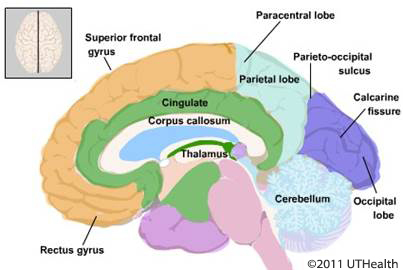 The limbic lobe is not a true lobe and is comprised of several cortical regions such as the cingulate and parahippocampal gyri, some subcortical areas like the hippocampus, amygdala, septum, and other areas with their respective ascending and descending connections (figs. 8C and 9B). The limbic lobe is involved in memory and learning, drive related behavior, and emotional function. There are subcortical areas in the telencephalon like the basal ganglia and the amygdaloid nucleus complex. The corpus callosum is a collection of nerve fibers which connect the two hemispheres. The corpus callosum is divided into rostrum (head), body, the most rostrally part is the genu (knee) with connecting the rostrum and the body, and the splenium at the caudal extremity (fig. 10). Behavioral studies have shown that the corpus callosum play an important role in transferring information from one hemisphere to the other. Figure 10. The corpus callosum and its different parts. The second major derivative of the prosencephalon is the diencephalon. The diencephalon is the most rostral structure of the brain stem; it is embedded in the inferior aspect of the cerebrum. The posterior commissure is the junctional landmark between the diencephalon and the mesencephalon. Caudally, the diencephalon is continuous with the tegmentum of the midbrain. During development the diencephalon differentiates into four regions: thalamus, hypothalamus, subthalamus and epithalamus (fig. 11). The epithalamus comprises the stria medullaris habenular trigone, pineal gland and the posterior commissure (fig. 11). Figure 11. Midsagittal drawing showing the main structures of the diencephalon. The brain stem consists of mesencephalon (midbrain), metencephalon, and myelencephalon. The metencephalon and myelencephalon together compose the rhombencephalon (hindbrain), which divides into pons, and medulla oblongata (fig. 12). Mesencephalon (midbrain) is continuous with the diencephalons rostrally and with the pons caudally. The midbrain is the smallest part of the brain stem, being about 2 cm in length. It consists of a tectum posteriorly, a tegmentum inferiorly, and a base anteriorly. The tectum forms the roof of the cerebral aqueduct, which connects the third ventricle with the fourth ventricle and the tegmentum its floor. The base of the midbrain consists of the cerebral peduncle, which contain nerve fibers descending from the cerebral cortex. The nuclei of the 3rd (oculomotor), the 4th (trochlear) and part of the 5th (trigeminal) are located in the midbrain tegmentum. The red nucleus and the substantia nigra, two prominent nuclei, are also found in the midbrain tegmentum. The midbrain tectum is formed by two pairs of rounded structures: the superior and inferior colliculi. The superior and inferior colliculi (fig. 12) are involved in visual and auditory functions respectively. Figure 12. Midsagittal drawing of the brain stem. The pons is continuous with the midbrain and is composed of two parts, the pontine tegmentum (located internally) and the basilar pons. At the level of the pons, the cerebral aqueduct has expanded to form the fourth ventricle (fig. 12). The cerebellum is situated posterior to the pons and forms part of the roof (tectum) of the forth ventricle. The pons contains nuclei that receive axons from various cortical areas. Projections from the axons of these pontine neurons form large transverse fiber bundles which traverse the pons and ascend to the contralateral cerebellum via the middle cerebellar peduncles. Also, within the pons base and tegmentum are longitudinally ascending and descending fibers. The nuclei of the 5th (trigeminal), 6th (abducens), 7th (facial) and the 8th (vestibulocochlear) nerves are located in the pons tegmentum. Medulla Oblongata (myelencephalon is also known as the medulla). The medulla lies between the pons rostrally and the spinal cord caudally. It is continuous with the spinal cord just above to foramen magnum and the first spinal nerve. The posterior surface of the medulla forms the caudal half of the fourth ventricle floor and the cerebellum, its roof (fig. 12). The base of the medulla is formed by the pyramidal-descending fibers from the cerebral cortex. The medulla tegmentum contains ascending and descending fibers and nuclei from the 9th (glossopharyngeal), 10th (vagus), 11th (accessory) and the 12th (hypoglossal) nerves. The corticospinal fibers (pyramid) are alongside the anterior median fissure, and decussate (cross the midline) to the contralateral side on their way to the spinal cord. Other prominent structures in the medulla are the inferior olive, and the inferior cerebellar peduncle. The medulla contains nuclei which regulate respiration, swallowing, sweating, gastric secretion, cardiac, and vasomotor activity. 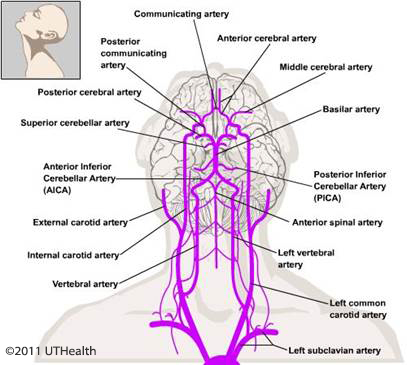 The arterial blood supply to the brain is derived from two arterial systems: the carotid system and the vertebrobasilar system. A series of an anastomotic channels lying at the base of the brain, known as the circle of Willis, permits communication between these two systems (fig. 13). Figure 13. Schematic drawing showing the main arterial blood supplies to the brain. 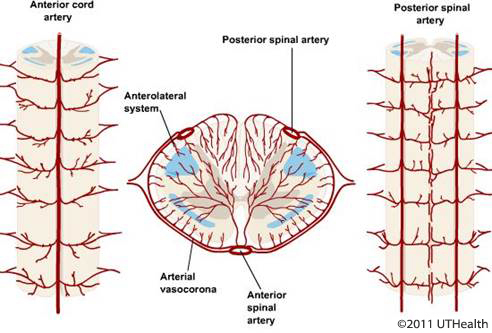 The arterial blood supply to the spinal cord is derived from two branches of vertebral artery, the anterior and two posterior spinal arteries which run the length of the spinal cord and form an irregular plexus around it (fig. 14). Figure 14. Schematic drawing of the spinal cord arterial blood supply. The PNS includes 31 pairs of spinal nerves, 12 pairs of cranial nerves, the autonomic nervous system and the ganglia (groups of nerve cells outside the CNS) associated with them. Also included in the PNS are the sensory receptor organs. 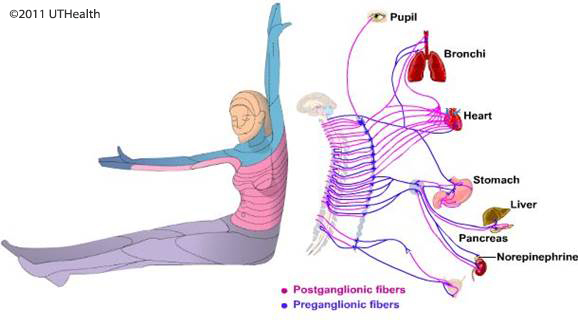 The receptor organs are scattered in all parts of the body, sense and perceive changes from external and internal organs, then transform this information to electri­cal signals, which are carried via an extensive nervous network to the CNS (fig. 15). The cranial and spinal nerves contain nerve fibers that conduct information to-afferent-(Latin for carry toward) and from-efferent (Latin for carry away) the CNS. Afferent fibers convey sensory information from sensory receptors in the skin, mucous membranes, and internal organs and from the eye, ear, nose and mouth to the CNS; the efferent fibers convey signals from cortical and subcortical centers to the spinal cord and from there to the muscle or autonomic ganglia that innervate the visceral organs. The afferent (sensory) fibers enter the spinal cord via the dorsal (posterior) root, and the efferent (motor) fibers exit the spinal cord via the ventral (anterior) root. The spinal nerve is formed by the joining of the dorsal and the ventral roots. The cranial nerves leave the skull and the spinal cord nerves leave the vertebrae through openings in the bone called foramina (Latin for opening). Figure 15. Schematic drawing of the peripheral nervous system. The enteric subdivision is a complex neuronal network within the walls of the gastrointestinal system and contains more neurons than the spinal cord. The visceral (autonomic) system regulates the internal organs outside the realm of conscious control. The PNS component of the somatic system includes the sensory receptors and the neurons innervating them and their nerve fibers entering the spinal cord. The visceral and the somatic nervous system are primarily concerned with their own functions, but also work in harmony with other aspects of the nervous system. Figure 16. Schematic drawing showing the autonomic nervous system. C, T, L and S indicate the cervical, thoracic, lumbar and sacral levels of the spinal cord, respectively. III, VII, IX, X indicate the 3rd, 7th, 9th and 10th crania nerves respectively. In this section you will be introduced to representative sections through the human CNS. They will acquaint you with prominent structures that will help you to recognize the level and orientation of the section and provide landmarks for locating nuclei and tracts involved in sensory and motor functions. 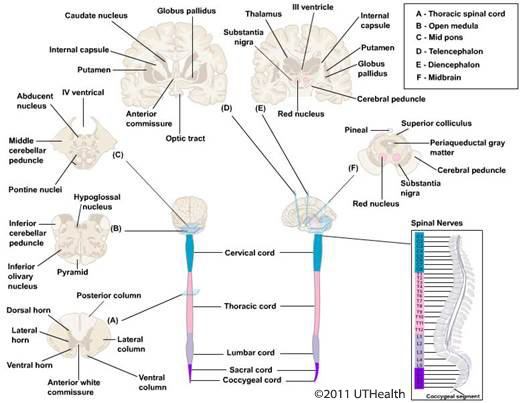 Directional terms are used in describing the locations of structures in the CNS. Figure 17. Orientation of the central nervous system of the spinal cord and different brain sections. Keep in mind that certain terms were developed to describe the nervous system of quadrupeds and may have a slightly different meaning when applied to bipeds. For example, the ventral surface of the quadruped spinal cord is comparable to the anterior surface of the biped (fig. 18). In the following descriptions, the terms are applied to a standing human. The terms rostral and anterior refer to a direction towards the face/nose. The terms caudal and posterior refer to a direction towards the buttocks/tail. The terms inferior and superior generally refer to spatial relationships in a vertical direction (fig. 18). A coronal section is parallel to the vertical plane and a midcoronal section would divide the head into anterior and posterior halves (fig. 19). The sagittal section is also parallel to the vertical plane, but a midsagittal section would divide the head into right and left halves. The horizontal (axial) section is parallel to the horizontal plane and a mid horizontal section would divide the head into superior and inferior halves. Transverse or cross sections of the spinal cord of humans are taken in a plane perpendicular to the vertical (i.e., in the horizontal plane of the head). Most electromagnetic imaging techniques produce images of the brain in the coronal, horizontal (axial) and sagittal planes. The representative sections are transverse sections through the spinal cord and brain stem and coronal sections through the telencephalon and diencephalon (fig. 17). Figure 18. A schematic illustration showing the brain direction. Figure 19. A schematic illustration showing the three planes of brain section. This section was taken at the level of the thoracic spinal cord (fig. 17A). The spinal cord neuron (gray matter) form a central core taking a butterfly configuration that is surrounded by nerve fibers (white matter). In the left and right halves of the spinal cord, the gray matter is organized into a dorsal horn and ventral horn with the intermediate gray located between them. In the thoracic spinal cord, which is illustrated in this figure, a lateral horn extends laterally from the intermediate gray (fig. 17A). The spinal cord white matter is subdivided into the posterior white column, the anterior white column and the lateral white column. The anterior white commissure joins the two halves of the spinal cord and is located ventral to the intermediate gray. The dorsal root fibers enter the spinal cord at the dorsolateral sulcus and the fibers of the ventral root fibers exit the spinal cord in numerous fine bundles through the ventral funiculus (see figs. 1-5). (Figure 17B) This is a section taken at the level of the upper medulla. Landmark structures include the fourth ventricle, hypoglossal nucleus, inferior cerebellar peduncle, inferior olivary complex and the pyramids. As in the spinal cord section, the fiber tracts, the inferior cerebellar peduncle and pyramids, appear dark in this section while the nuclei in the inferior olivary complex appear light. (Figure.17C) This is a section taken at the level of the mid pons. Landmark structures include the fourth ventricle, the pons tegmentum, which includes the abducens nuclei; the pons base, which includes the corticofugal fibers and pontine nuclei; and the middle cerebellar peduncles. (Figure 17D) This is a section taken at the level of the decussation of the anterior commissure. Landmark structures include the head of the caudate nucleus, the anterior limb of the internal capsule, the globus pallidus and putamen (all-important in controlling motor functions). The anterior commissure, a fiber bundle connecting the right and left frontal lobes, can be seen decussating (crossing the midline). The corpus callosum forms a thick band of decussating nerve fibers located above the lateral ventricles. Below the telencephalon afferent nerve fibers from each eye decussate in the optic chiasm and join uncrossed fibers to form the optic tract. (Figure 17E) This is a section taken at the level junction of the midbrain with the diencephalon. Notice that the plane of section differs from those of previously viewed sections. At this level, a landmark structure of the diencephalon is the thalamus, which surrounds the third ventricle. The posterior limb of the internal capsule separates the thalamus from the surrounding telencephalic structures, i.e., the globus pallidus and putamen. Lateral to the putamen is the insula while more dorsomedially the corpus callosum overlies the cavities of the lateral ventricles. Below the third ventricle are the red nucleus, substantia nigra and crus cerebri of the midbrain, which are the continuation of the internal capsule. (Figure 17F) This section aims to show the main midbrain nuclei which include the tectum (superior colliculi) the periaqueductal gray, the red nuclei, substantia nigra and the cerebral peduncles.